This unit is now obsolete. The nearest replacement is the Laser Methane Mini Gen2. Laser Methane can detect methane at concentrations between 2 - 10,000ppm-m up to 150 metres away in a lightning fast 0.1 seconds, even through glass. No direct contact with the methane gas is required so no entry into a hazardous area is needed. The lightweight Laser Methane is selective to methane and does not respond to other gases. The portable, compact device comprises a single 'gun' unit with no additional parts or battery packs, making it very easy to carry and operate in the field. Controls, indications and display are on the back of the unit so are in plain site when aiming Laser Methane at a target. It has a built-in test cell which self-tests the instrument at switch-on and during use. 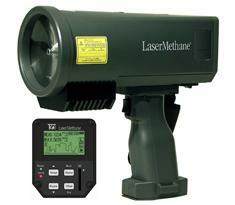 When methane is detected, the basic unit's LED light and buzzer give visual and audible signals respectively. There is also an upgrade option with a display of actual gas readings in a graphical format which may be saved to a built-in SD memory card and downloaded to a PC. Applications include gas transmission network surveys (including compression stations), landfill site monitoring and other areas where methane leakage, migration or build-up is a risk. The unit can also be fixed in a permanent position to periodically scan a given area. Accessories include a spare battery pack and charger, soft carry case, hand and shoulder straps and earphones. The Laser Methane conforms to EN 61000-6-4: 2001 and EN 61000-6-2:1999 in Europe, 21 CFR 1040.10 and 1040.11 in USA and the laser has a safety rating of IEC 60825-1 (JIS C6802).